The Bronx-born actress and director died last night at her Hollywood Hills home from complications from diabetes, said her publicist Michelle Bega. 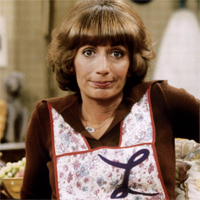 Marshall was nominated for three Golden Globes for the role that made her famous: Laverne DeFazio on the ABC Happy Days spinoff Laverne & Shirley. For eight seasons, from 1976 to 1983, Marshall co-starred with Cindy Williams as best friends, roommates and co-workers at a brewery in 1950s Milwaukee on the sitcom co-created by older brother Garry Marshall. Marshall followed her sitcom career by directing hit films like Big and A League of Their Own. Marshall and Williams' reunited on screen in 2013 for the Nickelodeon sitcom Sam & Cat. Marshall was also The Simpsons' first guest-star, appearing as Ms. Botz, "The Babysitter Bandit," on the first season. Actors paid tribute to Marshall on Twitter. "I grew up wanting to be as funny as Penny Marshall, and had the pleasure of meeting her a few times," tweeted Mayim Bialik. "Watch some old Laverne and Shirley to see why her brother Garry insisted on casting her. Comedy gold, she was." Added Patton Oswalt: "I had the good fortune to be directed by her once and she was sharp and smart and hilarious." Rosie O'Donnell, whom Marshall directed in A League of Their Own, tweeted she was "simply heartbroken," linking to a video of a 1996 Kmart commercial they did together.